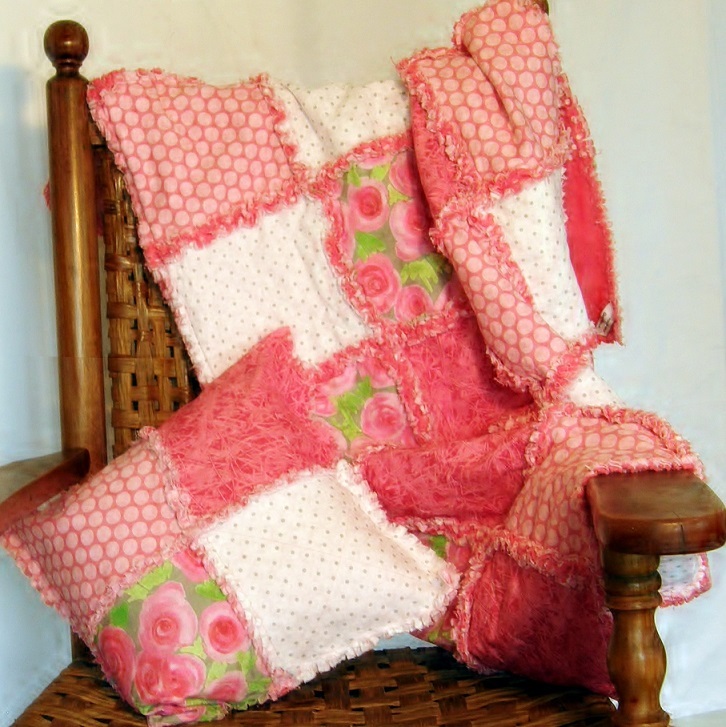 Don't you just love handmade baby quilts? Our handmade baby rag quilts are made with loving care to ensure everything about them is perfect. 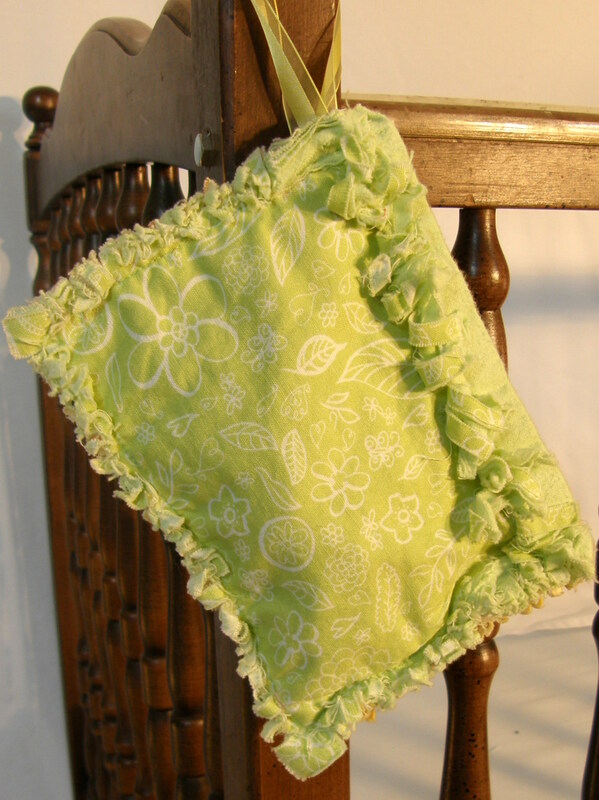 We have a very unique line of products with baby rag quilts, rag quilt throw pillows, rag quilt burp cloths and pacifier holders. We are constantly working on designing new and delightful products. Every one of our baby quilts has a fresh twist on children's rhymes and songs. Each is a fabulous creative interpretation of a child's verse, nursery rhyme or favorite song. Our themes make these items so special and unique. That's all we use to make our delightful baby quilts, pillows, burp cloths and pacifier holders. This incredible renewable resource is the perfect fabric for babies. We carefully select each print and solid in patterns and colors to create a beautiful interpretation of a verse. For our baby rag quilts, we layer three squares of the cotton fabrics. 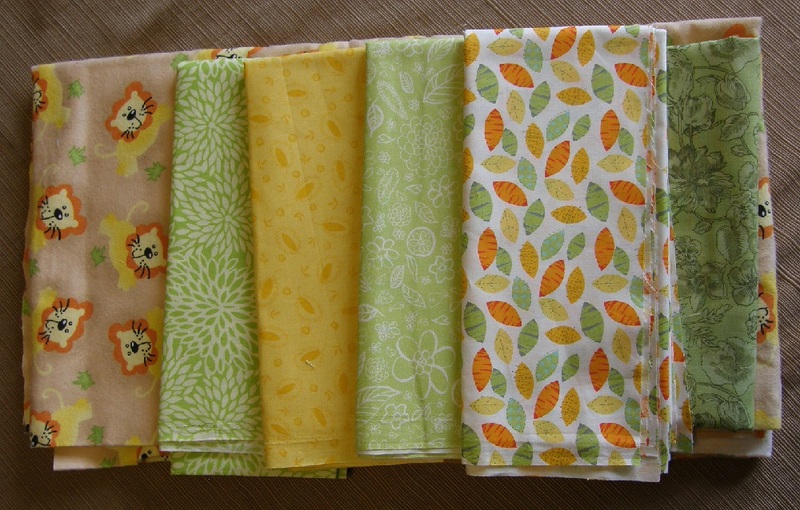 This layering creates a lightweight quilt that is perfect for babies and toddlers. Our quilts are not heavy, which allow your baby to have a comfortable sleep. We all know a well rested baby is a happy baby! While lightweight, the layering of the cotton fabrics adds to the insulation effect, keeping your little one cozy and warm. Even in warmer temperatures, the quilts are not too warm, as the fabric draws heat away from their little bodies. Our pillows are perfect for that added touch to your nursery or toddlers room. 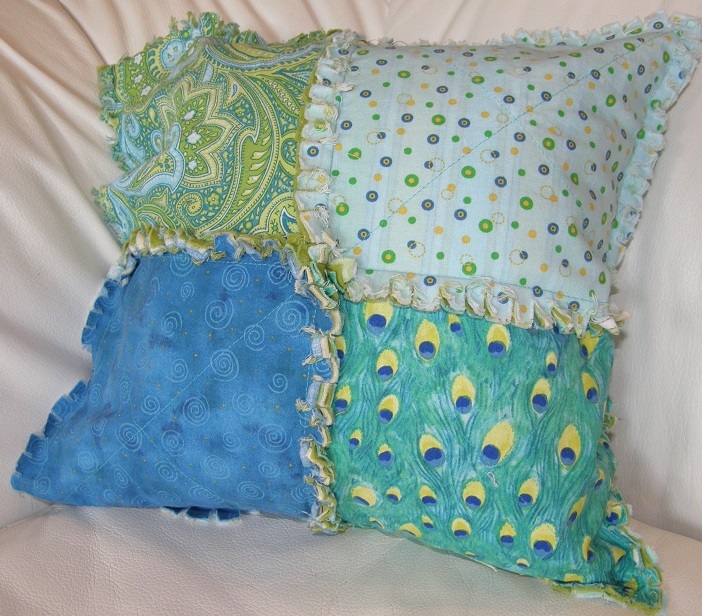 Each pillow is created from beautiful colorful prints and solid fabrics. All of our pillows are designed to coordinate with many of our baby rag quilts. So while you're shopping check out our decorative throw pillows. We may just have the perfect complimentary pillow for your favorite quilt. Everyone that has ever fed and burped a baby knows the importance of covering one's shoulder to protect your clothes from the inevitable. Now you can do that with the most colorful, most unique, most adorable burp cloth ever! 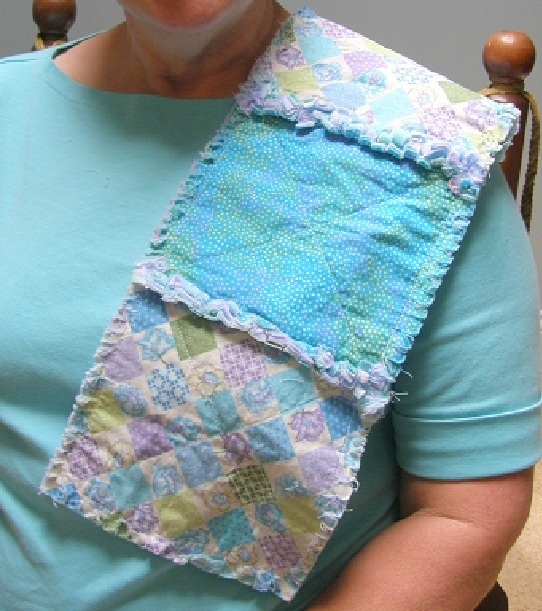 Why look tacky with that stained cloth diaper on your shoulder, when you can look fun and colorful with a rag quilt burp cloth! There's no need to fumble around in the dark in the middle of the night trying to find that pacifier your little one lost and is now screaming for you to find. With our totally adorable Pacifier Holders, you can always have plenty of spare pacifiers or "binkys" readily available and at your fingertips. Just tie them onto your baby crib, the changing table or a handy door knob. 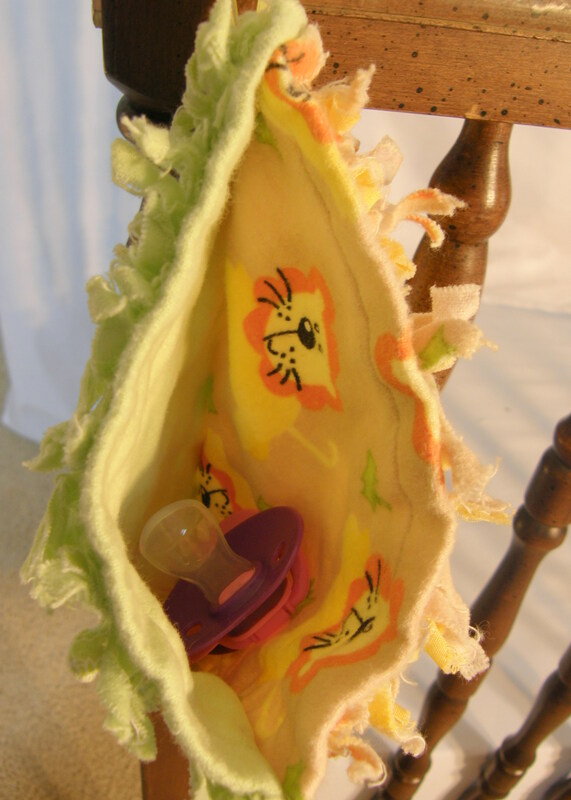 Keep some extra binky's stashed inside the flannel lined bag and you'll always have one ready and waiting. Our unique quilted baby items are sure to become not only your favorites, but I'm sure they'll quickly become the favorites of many a little one. 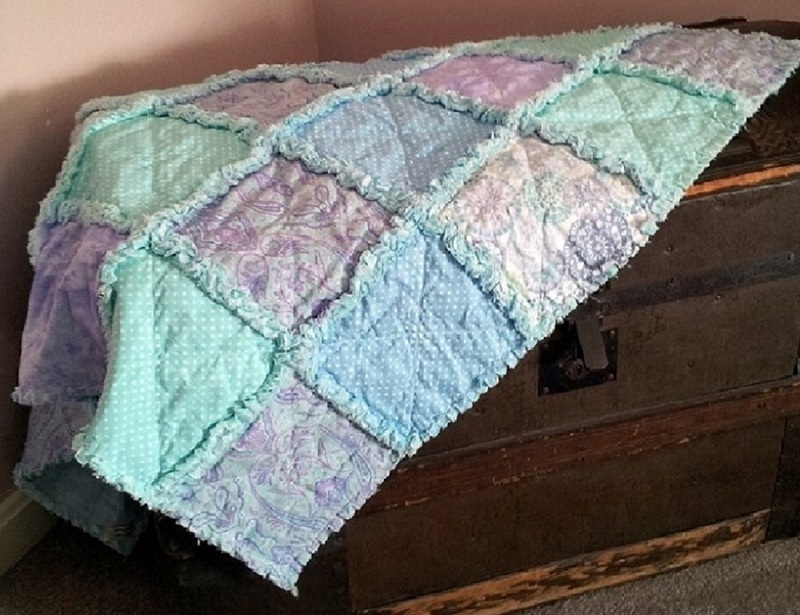 Find out why Janice Z says," Received the precious "What Are Little Boys Made Of" baby quilt and it is truly an heirloom treasure for our precious grandson." Or why Linda G says, "Comfortable and so uniquely beautiful! My grandkids love their quilts!" You won't want to miss the opportunity to own that absolutely perfect nursery rhyme themed baby quilt.